I've seen several comments on these forums downplaying Cyber-Godzilla from Godzilla: The Series as "the kaiju that was once killed by missiles," implying that even in his cyborg form he's still as fragile as his original form, which could not be further from the truth. There are several instances definitively showing Cyber-Godzilla's impressive durability and even some decent fighting potential, examples that seem to be ignored because of prejudice against 1998 Godzilla/Zilla. It's about time we revisit the unfortunately missed potential that is Cyber-Godzilla. Again, there are people here who assume Cyber-Godzilla is still the fragile kaiju that was killed by ordinary human missiles. His durability is actually very impressive, being arguably one of the most durable monsters of the series. This is Ts-Eh-Go, a mutant scorpion created by the military as a biological weapon. He brushes off fire from tanks and missiles like it's nothing (just like most kaiju). However, the atomic breath from the Godzilla (hereafter referred to as "Zilla Jr." for clarity) he faced killed him easily. Cyber-Godzilla survived multiple powerful blasts from this atomic breath, both to his armor (which survived with virtually no damage) and to exposed parts of his face. This is an atomic breath powerful enough to slice through thousands of tons of rock to plug up a volcano in seconds and create a supercell storm in clear weather. This kind of firepower could put down a lot of kaiju for good. Not Cyber-Godzilla! This one's uncertain, but one of the durability feats might suggest that Cyber-Godzilla has rapid regeneration. The mutant Armillaria, which could regenerate limbs and heal wounds instantly, withstood concentrated laser fire to its main body. 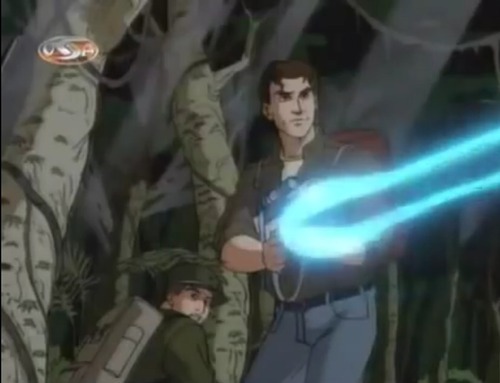 The laser rifles of this show are strong enough to shoot through trees. Zilla Jr.'s atomic breath was strong enough to overcome that regeneration and burn the Armillaria to ash. Cyber-Godzilla was able to quickly get back up and start fighting after taking a sustained atomic breath to the face, with few to no signs of injury after being knocked unconscious (with burns on his face). Cyber-Godzilla has energy missile launchers mounted on his back plates that can rapid-fire Tachyon energy missiles. 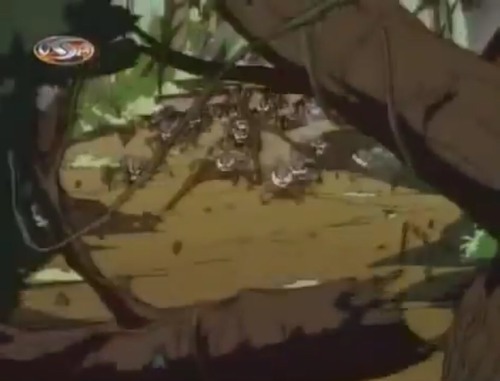 The Tachyon missiles are strong enough to kill the Queen Bee, who survived a mountain-destroying volcanic explosion. These missiles can be powered-up to create some devastating explosions. That's a pretty big dust cloud that missile caused (if it had been caused by Zilla Jr.'s digging, we would see dust clouds like this every time he digs, but this is the only time a dust cloud like this appears). Cyber-Godzilla is also armed with an atomic breath similar to Zilla Jr.'s except blue in color. Admittedly, we don't have many (if any) examples of Cyber-Godzilla's atomic breath's power, but that must have been a big explosion to be visible from that angle. Cyber-Godzilla retains the speed and agility of his previous form. 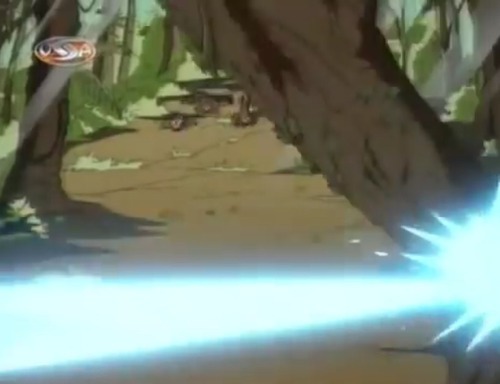 He's fast enough to dodge and shoot down missiles moments before they hit him. Now, we don't really see Cyber-Godzilla take down any enemies aside from the Giant Bat, and Zilla Jr. was fast and skilled enough to dodge all of his attacks, but Cyber-Godzilla had a bite attack in his previous form that could come in handy. Simply put, Cyber-Godzilla has real potential, but his only true battle was against his own offspring, who was much more battle-experienced than Cyber-Godzilla. The creators of the series really could have done more to showcase Cyber-Godzilla's power (and they should have considering he was the highlight of the show's first season). So, what can we take away from all of this? The Tachyons really knew what they were doing! Good RT, only objection I have is that calling that storm from the episode with the ice monster a "hurricane" is a bit of a huge exaggeration... a more accurate term would be "swirly cloud" (that's proper meteorological terminology, true story). The bite feat ain't really that impressive, given how many other Kaiju could have done it. And yes, piercing missles has potential to do more damage. I made a calculation for the scene that inolves Cyber-Zilla getting blasted high into the air. This might be more force per square meter than a massive ordnance penetrator, at least based on this comment (SPOILERS for Shin Godzilla). Can anyone confirm?